Toshiba on its way to introduce its first tablet in market soon.The tablet is named as Toshiba GuideBook.The information reveals that the new Toshiba GuideBook tablet comes in convertible form factor with dual-screen. The new Toshiba GuideBook tablet packs a dual 7-inch touchscreen display in which one an be used as a virtual keyboard.The new Toshiba GuideBook tablet runs on Windows 7 OS.Detailed specifications are not revealed yet. 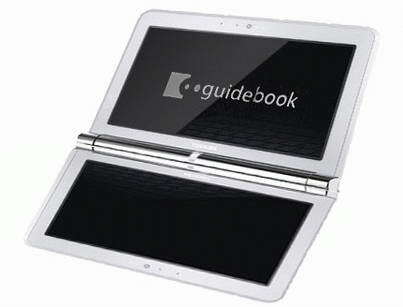 Toshiba GuideBook tablet is expected to debut by the end of this month. Tags:-dual-screen tablet, Toshiba GuideBook tablet details, Toshiba GuideBook features, Toshiba GuideBook tablet features, Toshiba GuideBook tablet specifications, GuideBook, Internet tablet, tablet, toshiba, Toshiba GuideBook.